Str. głównaHydrobiologyHow many indicator species are required to assess the ecological status of a river? How many indicator species are required to assess the ecological status of a river? The presented research focused on macrophytes, which constitute a primary element in the assessment of the ecological status of surface waters following the guidelines of the Water Framework Directive. In Poland, such assessments are conducted using the Macrophyte Index for Rivers (MIR). The objective of this study was to characterize macrophyte species in rivers in terms of their information value in the assessment of the ecological status of rivers. The macrophyte survey was carried out at 100 river sites in the lowland area of Poland. 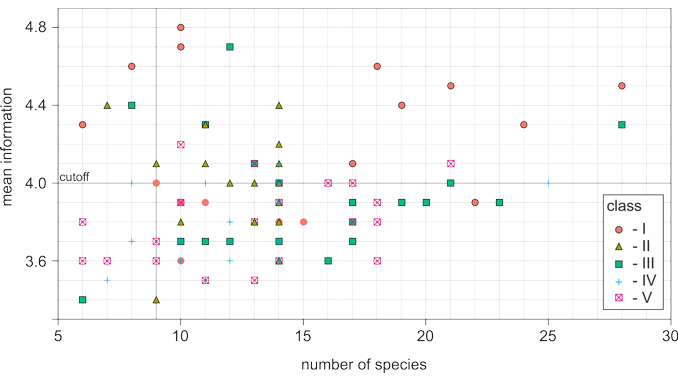 Botanical data were used to verify the completeness of samples (the number of taxa). In the presented research, the information provided by each species was controlled. Entropy was used as the main part of information analysis. This analysis showed that the adoption of a standard approach in the studies of river macrophytes is likely to provide sample underestimation (with missing species). This may potentially lead to incorrect determination of MIR and thus result in a wrong environmental decision. On this basis, a sample completeness criterion was developed. Using this criterion, the average value of information for macrophyte species in medium-sized lowland rivers is sufficient to be considered representative.